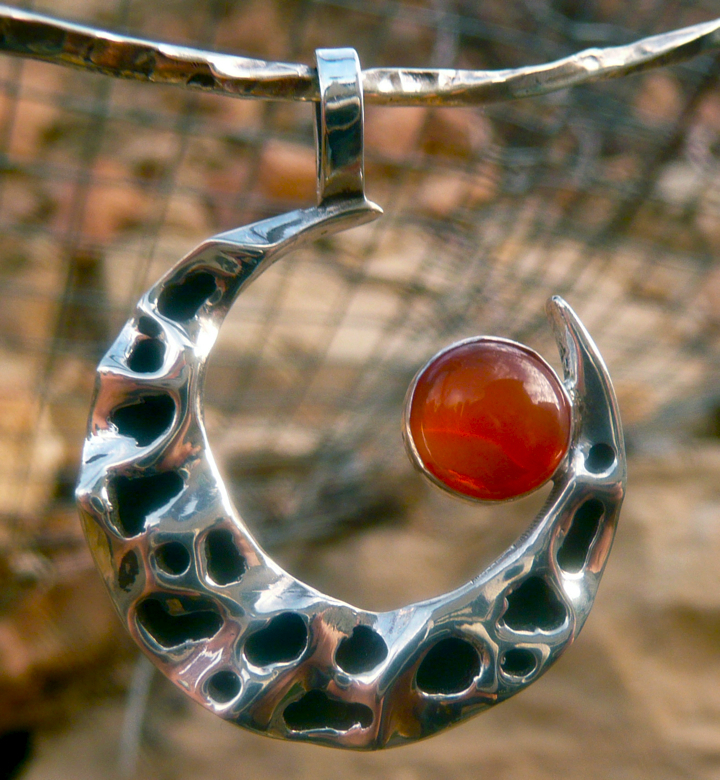 The carnelian in this pendant is very vibrant and translucent. I’ve created the piece so light can pass through the stone. The stone appears to change depending on the light — sometimes it looks like it’s on fire, and sometimes it looks like a hot coal. There is a small cloud in the stone as well, which makes the stone look almost stormy — if not smoldering. It reminds me of the Tucson sun at dips over the mountains at dusk – just between the light switching from golds, to reds, to violet. A fleeting, magical time of day. This a shadow box hollow body pendant using a hand-fabricated process. 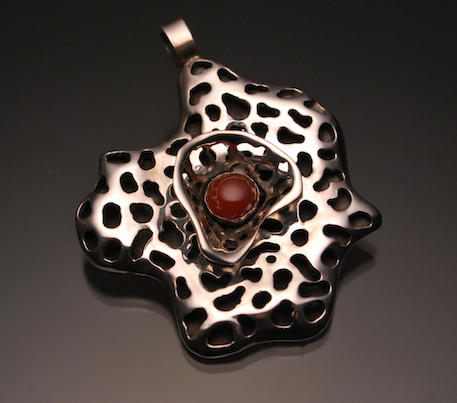 The pendant is one-of-a-kind. I have been having fun lately working with the almond/shield shape. The shape is very appealing on the wearer. It may be worn with a turtleneck, or a low-cut blouse or dress. Carnelian is a good first (root) and second (sacral) chakra energizer – which means it is good for vitality, abundance, and libido. It is also said to help with creativity and is sometimes called “the artist’s stone”. Lost Wax Casting, Fabricated Hollow Form.